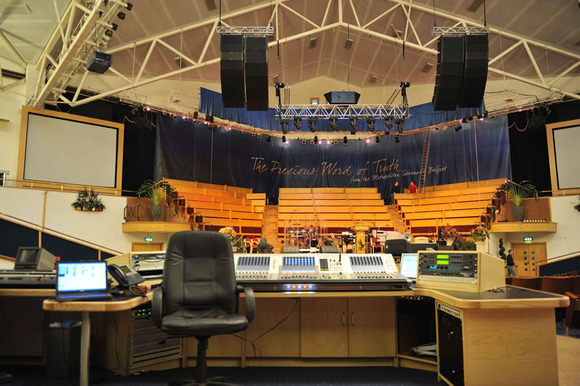 BELFAST, United Kingdom – The distinctive Studer Vista technology has proved very popular with the large houses of worship in North America and also in the Far East. Now the first Studer Vista 5 digital console has been chosen for a UK church, the Metropolitan Tabernacle in Belfast, which has been refurbished with one of the highest sound reinforcement system specifications in Northern Ireland. This impressive installation was completed entirely under the aegis of the Tabernacle’s in-house technical team, led by Trevor Bowron and Ian McAlees, members of which were unanimous in their choice of the 42-fader Vista 5, the first digital console for the church. Typically a service at the Metropolitan Tabernacle features an on-stage band with 4 or 5 players, a grand piano and a 200-piece choir, as well as the pastor and other speakers. “Normally we use about 70 channels of audio; there are 24 mics on the choir alone. We installed the Vista 5 with 88 mic inputs all patchable from the 140 mic points in the church, plus analogue and digital line-level inputs.” As well as giving quick access to such a large mix in a relatively small space, the Vista 5 impressed with its dedicated Aviom interface, fully integrated into the desk router. All the mixes are generated internally and driven directly from the desk.